Affected by the Equifax Data Breach? Here's What You Can Do. On Thursday, September 7, 2017, the Atlanta-based credit bureau, Equifax, announced that hackers had potentially compromised the sensitive information of 143 million American consumers from a cyberattack that occurred between May and July. With Social Security numbers, driver's license numbers, credit card information, addresses, and birthdates exposed to potential identity thieves, the Equifax data breach has affected an estimated 44% of the American population—meaning that you might be one of the millions of Americans affected. With the surge of consumer worry after the data breach news, Equifax has introduced a temporary solution: the company is offering a one-year trial of its TrustedID product, providing the opportunity to sign-up for free identity theft protection and credit file monitoring on its website. However, there's a catch. By registering for this product and agreeing to TrustedID Premier's lengthy terms of service, customers are forfeiting their right to join a class action lawsuit in a court of law and right to a jury trial in exchange for use of the credit protection product, and after the one-year trial-period, customers will be charged "an unspecified amount" unless they go through with the cancellation process. The same day the cyberattack was announced, a class action lawsuit against Equifax was filed in federal court in Atlanta. The federal class action lawsuit claims that Equifax executives sold "hundreds of thousands of dollars in stock" prior to going public with the data breach and seeks "as-yet-unspecified damages for negligence, violations of federal Fair Credit Reporting Act laws and Georgia's Fair Business Practices Act statutes". Akin & Tate, P.C. has experience in major national class actions concerning data breaches, with attorney W. Matthew Wilson serving as part of the leadership team in the class actions against Home Depot's 2014 major national data beach. In that suit, he helped recover $27 million on behalf of customers. Contact Akin & Tate, P.C. today if you are a victim of the 2017 Equifax data breach. Contact Akin & Tate, P.C. To determine if you're one of the millions of Americans affected by the 2017 Equifax data breach, please click here and fill out the brief form. Emma Paige Joins Akin & Tate, P.C. Attorney Emma Paige joins Akin & Tate, P.C. Does Georgia have a ban on ballot selfies? Yes. Is that law constitutional? Maybe not. As the final week of the 2016 campaign season ticks away, candidates and celebrities alike are urging us to cast our votes early. We are fortunate in Georgia to have nearly a full month of early voting opportunities. Tennessee also offers early voting, and it was there that Justin Timberlake created waves on Instagram recently by posting an early voting “ballot selfie.” Timberlake quickly removed the post, presumably because someone pointed out to him that Tennessee is one of more than two dozen states that has a ban on ballot selfies. No person shall use photographic or other electronic monitoring or recording devices, cameras, or cellular telephones while such person is in a polling place while voting is taking place . . . .
You may be asking what qualifies as a “polling place.” O.C.G.A. § 21-2-2 defines it as “the room provided in each precinct for voting at a primary or election.” In other words, from the moment you walk into the cafeteria, classroom, church hall, gym, firehouse, library, or other room where you will present your photo ID and cast your ballot, your cell phone and camera must be put away. But, the Timberlake episode and other ballot selfies that pop-up around this time each election year raise another question: should the government be able to ban ballot selfies? After all, researchers have shown ballot selfies may actually increase voter turnout. And Georgia’s Secretary of State annually encourages voters to #postthepeach after voting. Should a ballot selfie be treated any differently under the law? Turns out, Georgia’s ballot selfie ban might be unconstitutional. No Georgia court has heard a published case involving the ban, but three federal cases from other states—representing all the cases heard to-date on ballot selfie bans—help guide how a Georgia court might review Georgia’s law. Indiana’s law forbade voters from taking pictures of their ballots except to document and report a problem with their voting machines. In October 2015, a federal court in Indianapolis granted a preliminary injunction against Indiana’s ban on ballot selfies. The court held that whether considered under strict scrutiny or immediate scrutiny, “[a]t best, this statute is a blunt instrument designed to remedy a so-far undetected problem.” The federal trial court is still considering whether to permanently enjoin the statute, which if appealed, would be heard by the Seventh Circuit U.S. Court of Appeals. The case notably included a “friend of the court” brief filed by Snapchat encouraging the court to overturn the selfie ban. Snapchat argued that “[b]allot selfies are the latest in a long historical tradition of voters sharing their civic enthusiasm—and their votes—with their social networks.” Snapchat cited a Pew Research study showing “[t]wo-thirds of social-media users use their accounts for political or civic purposes . . . .” Snapchat also argued that the First Amendment protects the ability of the press and digital newsgatherers to share voters’ ballot selfies. As recently as last week, a federal court held that Michigan’s laws banning ballot selfies “‘significantly impinge’ upon First Amendment free speech rights, and, in prohibiting ballot selfies, fail tailoring, under either strict or relaxed strict scrutiny . . . .” However, this ruling was quickly appealed to the U.S. Court of Appeals for the Sixth Circuit (which, sitting in Cincinnati, hears federal cases on appeal from Kentucky, Michigan, Ohio, and Tennessee), which reversed the trial court’s decision a few days ago. Interestingly, if, after this election, the Sixth Circuit were to uphold the Michigan ban, that decision would be in direct opposition to the First Circuit’s decision in Rideout, creating a nice “circuit split” ripe for review by the U.S. Supreme Court. One wonders if Snapchat would release a special filter for oral arguments before the Supreme Court. Georgia: How Does this Affect Georgia’s Selfie Ban? So, where does that leave Georgia’s ban? Well, to be clear, all laws are considered valid until a court rules otherwise. But would a court uphold Georgia’s selfie ban? As a wise lawyer once said, it depends. Whether a Georgia court will ever hear arguments against Georgia’s ballot selfie ban is yet to be determined. But Ballot-Selfie-Gate-2016 has raised yet another reminder that it is the role of the judiciary to determine whether laws on the books are, in fact, constitutional. Should you stand accused of destroying democracy with a ballot selfie, please give us a call. In the meantime, make sure you’ve voted by November 8, and after you’ve left the confines of your polling place, don’t forget to #postthepeach. W. Matthew Wilson is a partner at Akin & Tate, P.C. and runs the firm’s Atlanta office. Matthew Wilson & Lester Tate at this year's Super Lawyer event. We are incredibly excited and proud to announce that Matthew Wilson has been selected as part of the Super Lawyers Rising Star list (under 10 years of practice) for 2017! Way to go, Matthew. W. Matthew Wilson Joins Akin & Tate, P.C. Akin & Tate is very excited to announce a new addition to our firm: Matthew Wilson, one of Atlanta's top young trial lawyers, will be opening up our Atlanta office. Welcome Matthew! To learn more about Matthew, click here. "What happens if an insurance company makes me a settlement offer?" This plaque honoring Warren Akin I is near the railroad depot in Downtown Cartersville, and he certainly made headlines in his day. Here, he’s called a “lawyer-minister-politician.” The elder Akin began practicing law in 1836, and argued the first case before the Georgia Supreme Court in 1848. He was an ordained Methodist minister and a Trustee of Emory College. From 1861 to 1863, he served as Speaker of the Georgia House of Representatives and as Confederate Congressman from 1864 to the end of the Civil War. — Lester Tate, Akin & Tate, P.C. "I think one of the biggest things is that you're talking about lawyers who generate a high, high volume of cases, because you're selling your legal services the same way you sell Ginsu knives." We are proud to be a 2014 Litigator Award Winner! Akin & Tate, P.C.  ranks among the Top 1% of all lawyers for: Personal Injury Litigation. Merry Christmas from Akin & Tate, P.C. Lester Tate, Jeff Davis, Robert Ingram, Judge Brenda Weaver, Richard Hyde, Judge John Allen at the 2014 Weltner Dinner. Lester is part of the Georgia Judicial Qualifications Commission won the Weltner Award from the First Amendment Foundation for its opinion on open courts. Congratulations!